The first season of The Handmaid’s Tale, Hulu’s adaptation of the eponymous Margaret Atwood novel, made for some of the best TV in 2017. Every bit as harrowing as its source material—in which the few fertile women left in the world are reduced to incubators by an oppressive, theocratic regime—Bruce Miller’s series was made all the more timely by the current administration’s attacks on women’s reproductive rights. But this bleak, brilliant drama drew viewers with its impeccably detailed interpretation of Atwood’s New England nightmare as much as for its pertinence. Under executive producer Reed Morano’s watchful eye, Gilead came to cold, regimented life, while Elisabeth Moss’ infinitely expressive face revealed more about the horrors of this new world than any stretch of dialogue could. But for many, as our reality began to look like a prologue to Atwood’s dystopian vision, The Handmaid’s Tale became as draining to watch as it was compelling. Hulu debuted the series last April with a three-episode block that was filled with more pain and despair than virtually anything else on TV. 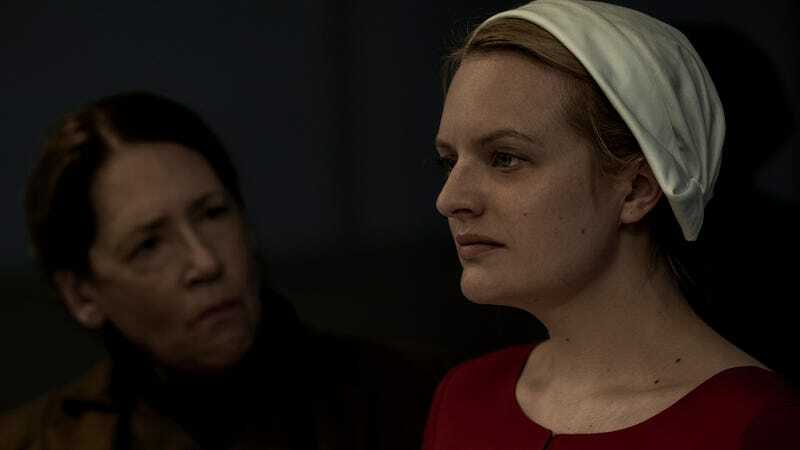 Miller’s writing tempered the misery with flashbacks to Offred née June Osborne’s (Moss) life before Gilead, and reassuring displays of her defiance in the present. But there was still a sense of relief when Hulu shifted to a weekly schedule for the rest of the season, which remains in place for season two. And this time, the premiere is made up of just two hour-long installments—but given that dozens of women are lined up on the gallows in the first five minutes, Miller and company aren’t exactly easing us back into the life of Offred. Everything from the photography to the tone is darker in season two; every moment of catharsis is quickly chased by another crushing blow. That makes a binge-watch as fraught a prospect as ever—but, aside from the occasional heavy-handedness and missteps in characterization, The Handmaid’s Tale remains a must-see. We pick up right where we left off at the end of the first season, with Offred being punished for working with Mayday, the underground resistance movement, after butting heads with Serena Joy (Yvonne Strahovski). Her wry voice-overs have been scaled back, even as we spend long stretches of time just sitting with Offred/June. Few other actors have ever held a camera’s gaze the way Moss does, so even when we’re just watching her watch a fateful news report, it’s engrossing. In addition to building a sense of dread, these quiet scenes and their shallow depth of field underscore just how isolated Offred is in the new season. She’s not just separated from her loved ones, including fellow handmaid Moira (Samira Wiley) and husband Luke (O-T Fagbenle), who found refuge in Canada last season. Offred’s pregnancy has set her apart from the rest of the handmaids, presenting new possibilities—and dangers. 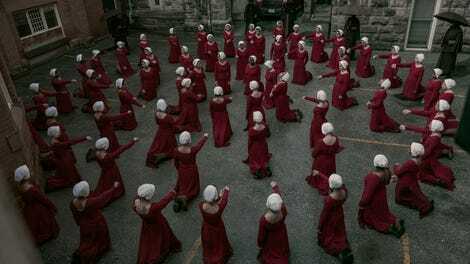 Among the other new developments this season is a proper introduction to the Colonies, the radioactive wasteland where Unpeople—including rebellious handmaids and LGBTQI people (disparaged as “gender traitors”)—are worked to death in a more expeditious manner than most. New deals are struck in bedrooms and boardrooms in equal measure, blurring the lines between the powerful and voiceless, the personal and the political. But this expansion is methodical; Miller, who wrote the first two episodes of the new season in addition to multiple season-one entries, peels back the layers just as meticulously as in his previous outing. Even as the show delves into foreign settings, it finds new flaws in Gilead’s opulent trappings to expose. The gorgeous palette is recreated time and again, whether the camera lingers in a stately manor, slaughterhouse, or polluted field. Unfortunately, that adage also applies to certain underserved characters. Most of the men, including Commander Fred (Ralph Fiennes) and Nick (Max Minghella), remain one-dimensional, which can be frustrating when we’re required to spend a significant amount of time with them, but is otherwise smart prioritization of storytelling. But as Moira, Wiley remains underutilized. We glimpse her new life in Canada, but it’s still enmeshed with Luke’s story and that of another (white) handmaid. Frankly it’s in everyone’s best interests to give Wiley more to do, but the show’s frustrating aversion to examining how race plays into this new world order is undercutting its relevance. Atwood’s novel skirted the issue, effectively banishing black people (and Jews) in a few sentences. Now that the series is no longer taking its cues from the book, it can only become more pertinent by acknowledging that there would still be a hierarchy among its imagined second-class citizenry. At the very least, it would help ground the stray references to “resisting” and Nazis made throughout the first six episodes. Miller has said that the new season will address race more explicitly; the new episodes do feature more black characters, including someone who reveals a key part of June’s past. Hopefully, the writers will get over their trepidation, because The Handmaid’s Tale is otherwise quite thoughtful in its exploration of privilege. The show expertly demonstrates how far apart Offred and Serena’s stations in life are, despite the fact that they sleep under the same roof. And that’s just one household. Morano’s career has taken her away from the series, but her god’s-eye view remains; aside from nodding to the theme of government intrusion, it also pans out to show that some cages might be bigger than others, but they’re still cages (or, as Offred muses, pens). But there’s no reason the creative team behind The Handmaid’s Tale should feel similarly restricted, not when it comes to tapping into an ever-present discussion. Was The Handmaid’s Tale’s departure from Gilead a success?